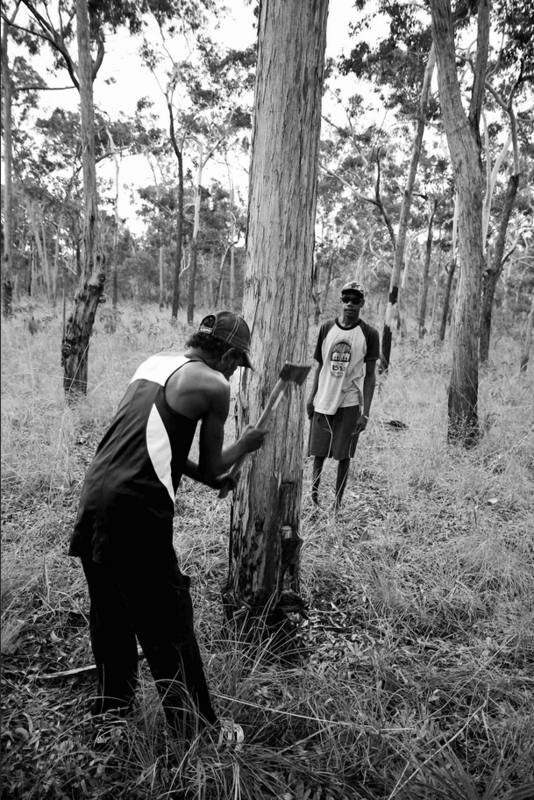 Buku staff members Bruce and Josh cutting bark. tip of the Top End of the Northern Territory, approximately 700km east of Darwin. Our primarily Yolngu (Aboriginal) staff of around twenty services Yirrkala and the approximately twenty-five homeland centres in the radius of 200km. In the 1960’s, Narritjin Maymuru set up his own beachfront gallery from which he sold art that now graces many major museums and private collections. He is counted among the art centre’s main inspirations and founders, and his picture hangs in the museum. His vision of Yolngu-owned business to sell Yolngu art that started with a shelter on a beach has now grown into a thriving business that exhibits and sells globally. In 1976, the Yolngu artists established ‘Buku-Larrnggay Arts’ in the old Mission health centre as an act of self-determination coinciding with the withdrawal of the Methodist Overseas Mission and the Land Rights and Homeland movements. In 1988, a new Museum was built with a Bicentennary grant and this houses a collection of works put together in the 1970’s illustrating clan law and also the Message Sticks from 1935 and the Yirrkala Church Panels from 1963. In 1996, a screen print workshop and extra gallery spaces was added to the space to provide a range of different mediums to explore. In 2007, The Mulka Project was added which houses and displays a collection of tens of thousands of historical images and films as well as creating new digital product. Still on the same site but in a greatly expanded premises Buku-Larrnggay Mulka Centre now consists of two divisions; the Yirrkala Art Centre which represents Yolngu artists exhibiting and selling contemporary art and The Mulka Project which acts as a digital production studio and archiving centre incorporating the Museum.